How much protein is in your chocolate protein breakfast or meal replacement shake? When deciding what kind of protein shake you should have for breakfast or as a meal replacement, it is vital that you learn a few facts about the proposed meal. What kind of protein is in your shake and how much protein are important questions to ask before engaging in any healthy diet option. I am currently on the “Chocolate Diet“, the XO healthy chocolate meal replacement shake that was featured on the cover of the American Journal of Bariatric Medicine called the Bariatician. The study published there showed the average participant lost 31 pounds in just 12 weeks. 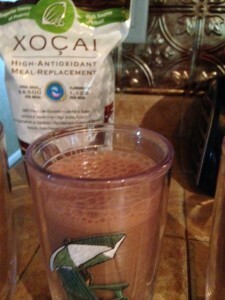 The XO meal replacement shake is 21 grams of protein and over 56,000 ORACfn (amount of antioxidants) in each serving! This is a great source of protein. This shake is made with cold pressed chocolate sweetened with acai and blueberry. It uses only whey protein isolate and not the cheaper whey protein. I also love that this is diabetic friendly and gluten free. I am on day 7 of my 8 week weight loss challenge with the Ripped and Rich program! There is still time for you to get in on the challenge. There is a contest in 5 categories where you can win cash and prizes. I love that not only am I losing weight but that this shake gives me so much energy. At 48 years old and dealing with chronic health conditions, I am thankful for this energy. replacement shake which is 28 meals or 56 snack size for body builders looking to bulk up. 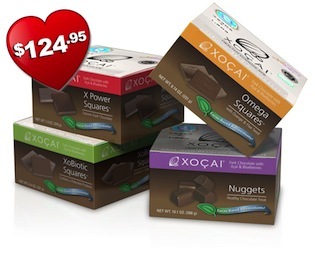 You also receive 12 of the Xe Energy drink for workout days and a box of 24 healthy chocolate nuggets for cravings. There are many yummy shake recipes. Many enjoy almond milk with their shake. I currently do a cup of water, a cup of ice, 1/2 a frozen banana and a touch of creamy natural peanut butter. I actually crave this amazing shake. It also fills me up I am sure because of the 21 grams of protein. I am not hungry for four hours after having my shake. Now that is a great thing. If you want a diet that tastes great, works and is actually good for you, the #RippedandRich program is for you. I am Lynette Henk, XO chocolate team leader. Contact me at 941-216-5727 or visitMyChocolateVitamins.com to place your order. Preferred customers receive FREE SHIPPING! Ask me how you can get paid well to help others lose weight and get healthy!